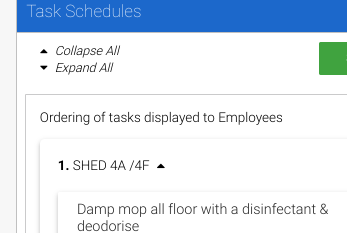 Once all your tasks are setup, you can re-order your tasks within freshOps, so that they appear on your team's Task List as similar as possible to the order they complete the work on site. When time is of the essence, it's important to manage what order our teams do what tasks within a site. New employees also benefit from having their Task list in the exact order the work should be done in. Step 3: You can then Drag & Drop by Location so that your team know which area to start cleaning first. Step 4: Within a Location, you can also Drag & Drop specific Tasks, to help staff also know which Tasks to do first and last. Tip: Use the Expand and Collapse Options to help aid the Drag & Drop process. Step 5: Ensure hit SAVE to update the order.